I have a wonderful new recipe to share with you guys. 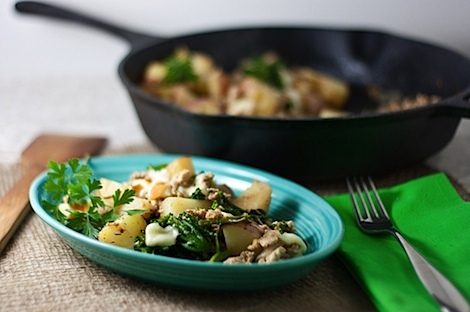 It’s light, it’s tasty, it uses up leftover cooked veggies, and you can cook it in one pot. I call it the One Pot Turkey Skillet Dinner Recipe (With Potatoes and Smoked Mozzarella). Now hubby and I have what I like to call a happy-cooking-relationship. We came up with it years ago, and it’s worked really well for us. The concept is simple: I cook, he cleans. Yet, although it’s tempting to dirty up as many dishes as possible, since I don’t have to worry about clean-up, in order to maintain the healthy relationship, I like to keep things as clean as possible whenever possible. 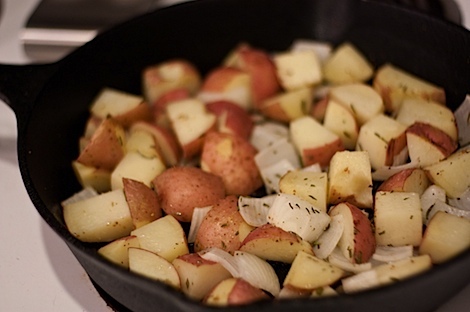 One of the easiest ways to keep things clean is to use less cookware. 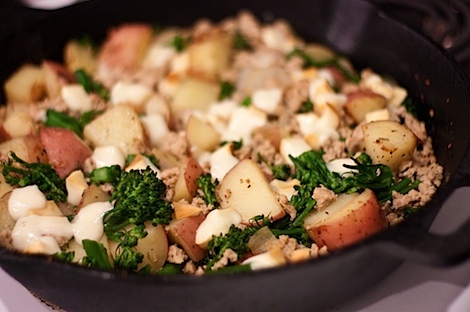 And who doesn’t love a one-pot meal, right? And this one pot will be a cast iron pan! 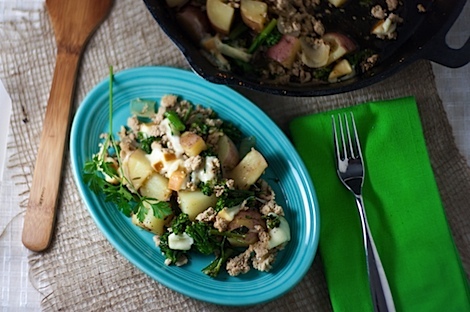 This One Pot Turkey Skillet Dinner Recipe isn’t the fastest in the world, but it’s easy as pie and tastes like amazing. I got the inspiration for this recipe whilst flipping through one of my favorite magazines – Clean Eating Magazine. I like turkey, I like potatoes, and I saw both in the picture. But I ended up putting quite the TCL twist on it adding fresh rosemary from my herb garden, broccolini, and subbing smoked mozzarella for the cheese in the original recipe. Pretty much you brown ground dark meat turkey in the pan and then set it to the side. Then you add potatoes, onion, fresh herbs, salt, and pepper. Stir to combine, put it in the oven and forget about it for a bit. …after de-glazing the pan with some broth, add that veggie to the pot along with your cooked turkey…plus additional salt and pepper, if needed. Stir and bake for 10 minutes longer. Psst – Important Tip: You can set the table, get drinks together, etc. while the dinner finishes up. …the mozzarella gets niiiiice and ooey-gooey. Yum! Garnish with fresh parsley, if you want. I like to rip mine over the meal. 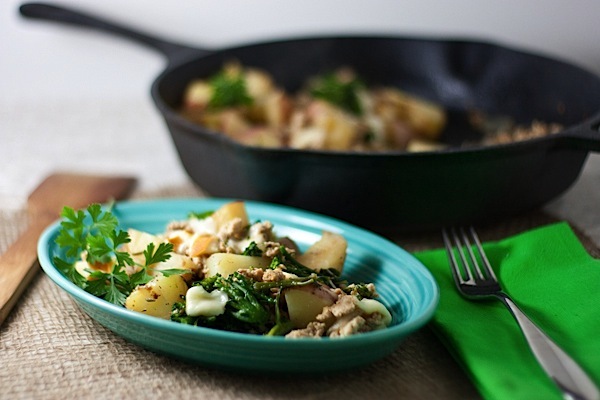 The parsley adds fresh little bites as you enjoy the skillet dinner. Doesn’t this whole thing sound simple? This easy one-pot dinner, inspired by a recipe I saw in the latest Clean Eating Magazine, makes for light comfort food with easy clean-up. 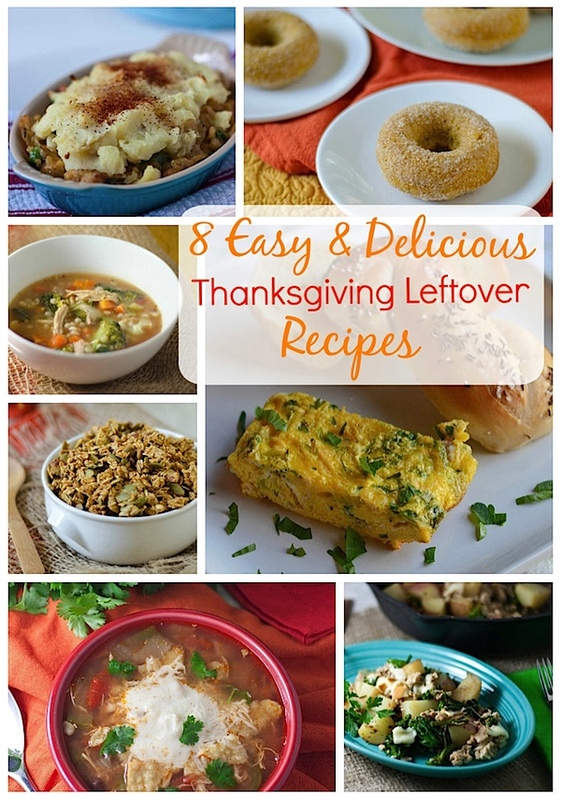 And you can even use up leftover cooked veggies. 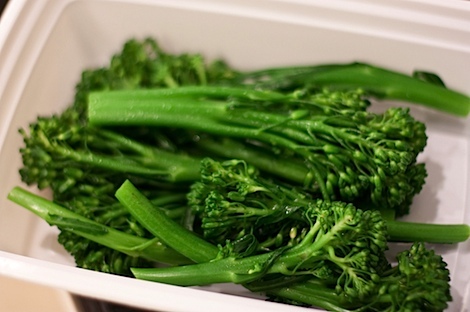 This recipe specifies broccolini, but any cooked veggie should work. Just use what you have. 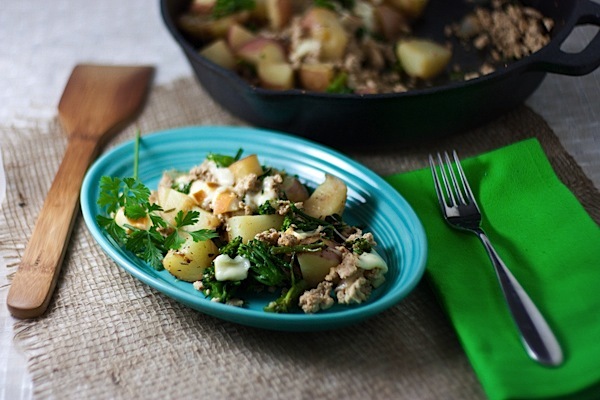 One bite of this cozy dish, and you’ll be hooked! Pre-heat a cast iron skillet (or other oven-proof pan) over medium heat. Add oil and spread. Add turkey and cook until turkey is cooked through (no longer pink). Remove to bowl and set aside for later. 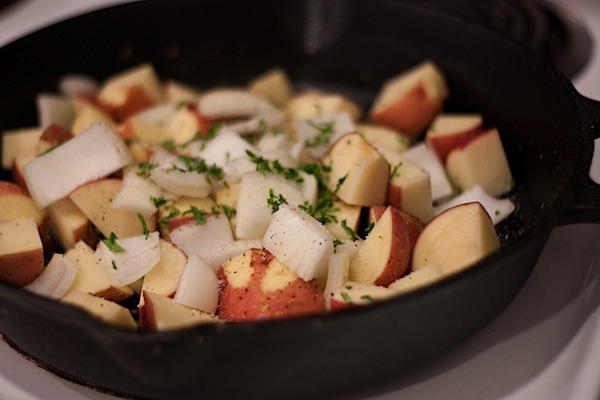 Add potatoes, onion, rosemary, salt, and pepper to skillet. Stir to combine and place in pre-heated oven. Bake for 15 minutes. Turn off burner. Remove skillet from oven (you can place it back on the burner you used before, but it doesn’t need to be on). De-glaze pan with broth by pouring broth into the skillet and scraping up any brown bits. 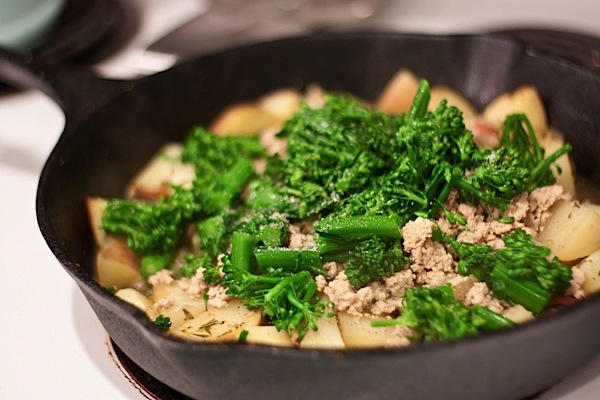 Add turkey, broccolini (or other vegetable) and if needed, salt and pepper. Stir to combine. Return pan to oven and bake for 10 minutes. 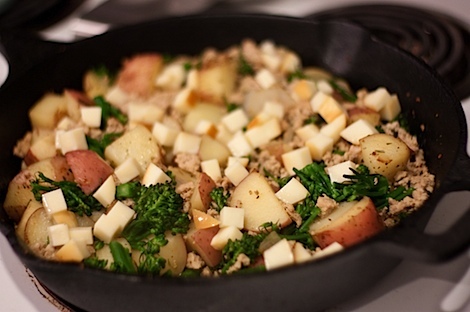 Remove skillet from oven, top with smoked mozzarella pieces, distributing evenly. Return skillet to oven and bake just until cheese melts, about 5 minutes. Garnish with fresh parsley, if using. Serve and enjoy! Click here to get free updates every time I post! And be sure to Like my TCL Facebook page for exclusive content. Reader Question: Who usually ends up doing the dishes in your house? 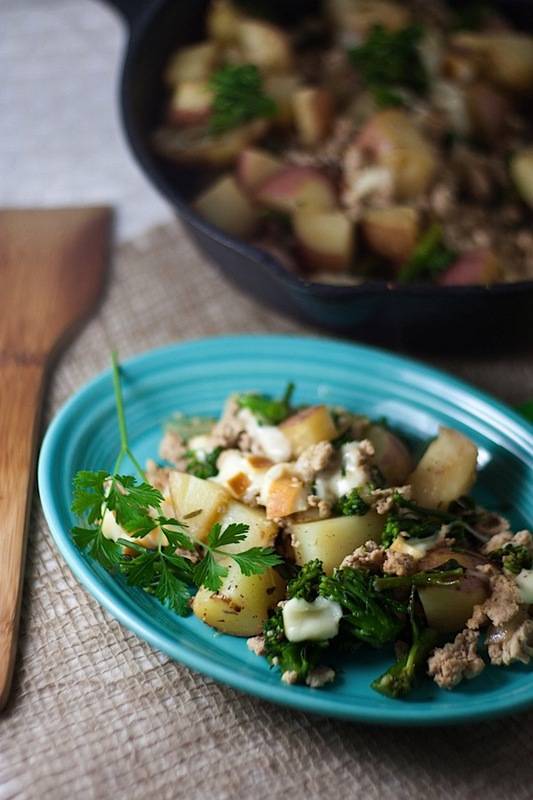 Simple food is always good – especially in summertime! This sounds really tasty. I hope the almond chicken wins the poll – so close!! Made this tonight; used sugar snap peas as the veggie, Edam cheese instead of the smoked mozzarella. My 3-year-old said, “I love my dinner!” It’s really good – the broth keeps it from getting too dry. Nice substitutions!! And that’s so flippin cute that your 3-year-old loved it, too! Awwwwwwww! 😀 Thanks so much for sharing Rachel! PS Welcome to the Zumba craze! 🙂 I was going to leave a comment on your blog, but I can’t because I don’t have a Google account. Anywho, glad you are enjoying it so far! Thank you! Zumba is totally addictive – I already enjoyed it when I wrote the article, but after meeting passionate instructors at the convention (and finding blogs like yours), it made me want to get even more into it!